Bitcoin appeared to have a flash crash on Tuesday morning after falling over $600 in a few minutes, but only one index logged the price move. The digital currency had hit a high of $4,867 early on Monday, according to industry website CoinDesk, its highest since September 2. But the same index showed that it dropped by over $600 to a low of $4,200 at roughly 9:00 a.m. London time. It was down some 12 percent for the session but quickly recovered within moments and was trading at $4,787 by 9:10 a.m. London time. The CoinDesk bitcoin price index is made up of the average price from four exchanges: Bitstamp, Coinbase, itBit, and OKCoin. Other indexes like Brave New Coin’s bitcoin liquid index showed no flash crash. Nor did CryptoCompare.com. CNBC checked the four exchanges that make up the CoinDesk bitcoin price index, but none showed any sign of a flash crash. CNBC has reached out to CoinDesk to see whether it may have been a problem with its own index. At around the same time as the crash, the Russian central bank proposed fresh restrictions on exchanges selling the cryptocurrency. Sergei Shvetsov, the first deputy governor at the Russian central bank, described the currency as “dubious” on Tuesday morning, according to Reuters. “We can not stand apart. We can not give direct and easy access to such dubious instruments for retail (investors),” Shetsov said, according to the news agency. Shvetsov, speaking at a conference in Moscow, said that Russia will block access to the websites of exchanges that offer cryptocurrencies such as bitcoin. But it’s thought unlikely that any regulatory change in Russia would move the price that much given that the country accounts for a very tiny portion of the entire bitcoin market. 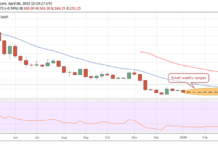 The post Bitcoin suffers mystery flash crash on popular cryptocurrency index appeared first on Crypto Quick News. Previous articleHave you got your Trezor hardware wallet yet?